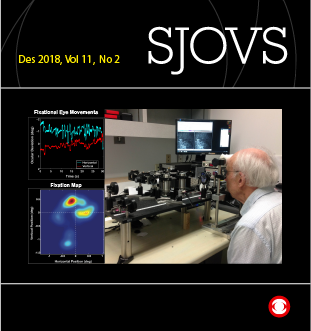 Scandinavian Journal of Optometry and Visual Science is a forum for promoting research amongst optometrists and other researchers in optometry and visual science in the Scandinavian countries Denmark, Iceland, Norway and Sweden. Cover Image: António Filipe Teixeira Macedo. Please see article in this issue. Cover Image: Vibeke Sundling. Please see article in this issue. Cover Image: Jonuscheit and Doughty. Please see page 1 this issue. Cover Image: Bruenech et al. Please see page 6 this issue. Cover Image: Sander and Li. Please see page 1 this issue. Cover Image: Ellen Svarverud. Please see page 9 this issue. Cover Image: Lawrence C. Sincich. Please see page 6 this issue. Available for free download from December 23. Articles are written in Norwegian, Danish, Sweedish or English, but the abstracts are published in both English and a Scandinavian language. For papers published in 2012 or earlier the English abstract of the articles written in Scandinavian can be downloaded by selecting the chosen article and clicking on Supplementary Files in the Article Tools menu at the bottom right of the screen.